Click here for more details on how to book with Potters. Please note that the special discounted prices quoted will only apply to bookings received up until 30th June 2018. Once you have booked your accommodation please complete and return an entry form along with your entry fee. 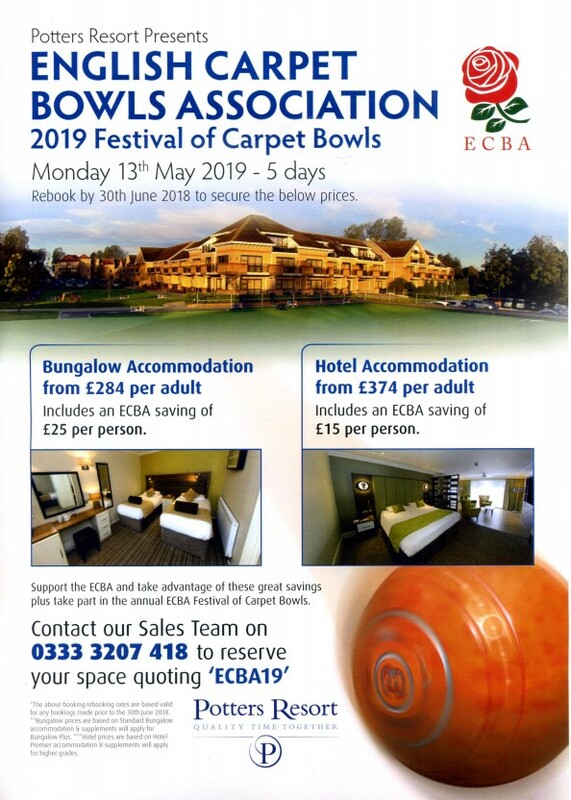 The Festival of Bowls is an annual event which takes place at Potters Holiday Village, Hopton Norfolk. The event is held over five days, and although there is a full bowling programme, the event is more relaxed than the various national championships. The Festival comprises 3 different competitions, Fours, Pairs and Singles. No one is automatically entered in all 3 competitions, so, for example, if you don't enjoy playing Singles, you do not have to do so, the choice is yours. The week starts off on Tuesday morning with the groups games for the Fours. Each team will be placed in a group, giving everyone 3 or 4 group games. The winners of each group will qualify for the Knockout Stages which will take place on Thursday morning, with the Final rounding off the week on Thursday afternoon. The Pairs starts on Wednesday. Again teams will be drawn into groups, giving everyone 3 or 4 games. The group winners will go forward to the Knockout Rounds which will be played on Thursday afternoon. And finally there is the Singles. Due to the numbers of entries this will be played on a straight knockout basis, starting on Tuesday afternoon. Wednesday afternoon will see the competition played down from the last 16 to the semi-finals, with the final being played on Thursday afternoon.